Crivit Soft Shell. Fleece Lined Jacket. Excellent Condition. This coat is in great condition. Zip To Bottom of Coat (Front) - 26.5". Zip To Bottom of Coat (Back) - 32.5". TRACHTEN BLUSEN. WALK -LODEN-JACKEN. JACKEN - JACKETTS. Crivit Regen Kapuzen Cape. Kapuze mit leichtem Schirm und Tunnelzug. KINDER BEKLEIDUNG. TRACHTEN HEMDEN. MARKEN - HEMDEN. TINY CATCH ON THE ARM BUT OTHER WISE IN GOOD CONDITION. ZIP UP FRONT. TRACHTEN BLUSEN. WALK -LODEN-JACKEN. JACKEN - JACKETTS. Kapuze mit Tunnelzug und kleinem Schirm an der Stirn, sowie kurzem, von Klettverschluss verdeckten Reißverschluss vorne am Ausschnitt. Crivit Kapuzen Regen Cape. TRACHTEN BLUSEN. WALK -LODEN-JACKEN. JACKEN - JACKETTS. Crivit Kapuzen Regen Cape. Kapuze mit Schirm an der Stirn und Tunnelzug, sowie kurzem Reißverschluss vorne am Ausschnitt. KINDER BEKLEIDUNG. TRACHTEN HEMDEN. >>>Size GB, UK ,IE, 44 is also a EUR 54. THAT LOOK SIMILAR >>>>>>>. >>>SIZE GB, UK ,IE, 42 is also a EUR 52. 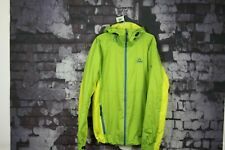 >>>SIZE GB, UK, IE ,40 is also EUR 50. windproof and waterproof water repellent - with sealed seams. 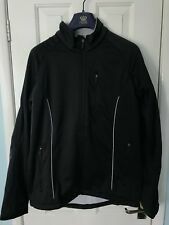 Crivit Mens Size M Black Soft Shell Jacket. Condition is New with tags. Brand new Crivit mens coat, size M 38/40 chest 3 in 1 very warm and wind/shower proof can be used in 3 ways - Fleece jumper windproof/showerprood jacket both together as winter coat. Unwanted Xmas present. Any questions just ask. HEATHER GRAY. Zip up front hooded fleece jacket in heather gray. Accents Blue Trim. Color Gray. Features Hood. Features All Seasons. Model IAN 310547. Length Hip. CONDITION; DIRTY AND MARKED. IF THE HOOD OR LINER IS VISIBLE IN THE PHOTOS, IT WILL BE INCLUDED. Shoulder to bottom: 29". Pit to cuff: 19.5". 30" full length from top to bottom (not including hood). Outershell: polyester. Lining: polyester. Warm winter jacket with zip-up, vecro closure with lots of features. Everything is in great condition and if there are any defects then it will be stated. DESIGNER | STILISTA : CRIVIT. CIRCONFERENZA BACINO 110. LUNGHEZZA TOTALE 73. LUNGHEZZA MANICA 69. SLEEVE LENGTH FROM ARMPIT TO CUFF - 22 " ( 55.9 cm ). FULL LENGTH - 66.9"( 170 cm ). WAIST - 18"( 45.7 cm ) ACROSS THE BACK. SLEEVE LENGTH FROM SHOULDER TO CUFF - 25.5 " ( 64.8 cm ). SHOULDER TO SHOULDER ACROSS - 23.75" ( 60.3 cm ). Skin remains comfortably dry for stable body temperature and ideal training conditions. Crivit Thin Black Jacket Zip up Size M 38/40 In good clean condition All items in my shop are used/preloved unless stated otherwise. Every item is cleaned and checked over so is listed as honestly as I can. Measurements are as the item is laid flat or manafactures labels. Accessories not included I want everyone to be happy with there purchases in the hope that you visit back. Happy to reduce postage on multiple purchases. Colour may vary slightly from pictures, I do try to edit pic to get the best idea of color but can't guarantee it. Fleece jumper. both together aswinter coat. can be used in 3 ways -. 100% polyester <<<. windproof and waterproof water repellent - with sealed seams. >>>Size GB, UK ,IE, 44 is also a EUR 54. THAT LOOK SIMILAR >>>>>>>. >>>SIZE GB, UK ,IE, 42 is also a EUR 52. material outer 100% polyester, lining 100% polyester. >>>Size GB, UK ,IE, 44 is also a EUR 54. THAT LOOK SIMILAR >>>>>>>. hood with elasticated band,drawstring and stopper. >>>SIZE GB, UK ,IE, 42 is also a EUR 52. >>>SIZE GB, UK, IE ,40 is also EUR 50. Windproof, waterproof, sealed seams. Bionic-finish just like nature. oil and soil repellent. makes textile care child's play. Outdoor technology-. >>>Size GB, UK ,IE, 44 is also a EUR 54. THAT LOOK SIMILAR >>>>>>>. >>>SIZE GB, UK ,IE, 42 is also a EUR 52. hood with elasticated band,drawstring and stopper. >>>SIZE GB, UK, IE ,40 is also EUR 50. Alemán para hombre para mujer Chaqueta de Lluvia Impermeable Otoño Cazadora GB IE40 42 44 46. Windproof and waterproof water repellent - with sealed seams. <<< ALSO. Size GB, UK ,IE, 42 is also a EUR 52. Size GB, UK ,IE, 44 is also a EUR 54. Size GB UK ,IE, 46 is also EUR 56. material outer 100% polyester, lining 100% polyester. >>>Size GB, UK ,IE, 44 is also a EUR 54. THAT LOOK SIMILAR >>>>>>>. windproof and waterproof water repellent - with sealed seams. SUPERB MADE TO A VERY HIGH GERMAN STANDARD.Practical and comfortable - ideal for outdoor activities. >>>Size GB, UK ,IE, 44 is also a EUR 54. >>>SIZE GB, UK ,IE, 42 is also a EUR 52. hood with elasticated band,drawstring and stopper. >>>SIZE GB, UK, IE ,40 is also EUR 50. <<<<< very. BEFORE ORDERING. >>>Size GB, UK ,IE, 44 is also a EUR 54. THAT LOOK SIMILAR >>>>>>>. >>>SIZE GB, UK ,IE, 42 is also a EUR 52. hood with elasticated band,drawstring and stopper. windproof and waterproof water repellent - with sealed seams.